NOTHING is now so elegant as a straw hat: they are worn either ornamented with the flower called convolvulus, or coloured like a shell, with a green or violet volute; or with open work, thick- set with points of plaited straw (as represented in the engraving), or trimmed round the edge with an aigrette de Sparterie. The plumes which were used to imitate the down of certain flowers are now applied in a manner extremely ingenious, so as to have the appearance of butterflies. Ribbons are worn either clouded or striped, the latter are nankeen. The neck-kerchief, called fichu-chemise, has given place to the common handkerchief: it is worn of silk striped, or having white flowers on a red ground. We see many robes of sky-blue crape, black crape, and red-poppy crape. Those of black crape have a jet-black trimming. For morning dresses, linen gowns, in large diamonds or squares, are fashionable. The custom is almost general to wear the ends of the sleeves white, with robes of various colours. The white apron is become an article of dress. The hot weather has introduced the use of veils, which are worn very long, of simple muslin, or with a rich English or Mechlin lace. Long gloves, which reach above the elbow, are not yet laid aside. The medallions, called breviaries, and the chains from their crossing called saltiers (See the plate), are much worn: some medallions are made shaped like the bags, called ridicules. The latter are of the lozenge or hexagon shape, with a small tassel at each angle. After having buttoned their robes behind, from top to bottom, a few élégantes have conceived the whimsical idea of placing buttons before upon the handkerchief. This fashion is more of a whim, like that of long sleeves, bound with six or seven bracelets, parallel to each other. The Gingham robes, silk handerchiefs, and shawls, are almost all striped in large diamonds. White aprons are very much worn, some trimmed with lace, and some edge with white cornette.  In the plain silks, jonquil is the most prevailing colour. Spencers are also very much worn, with two very long points before, like those of an handkerchief, with tassels at the ends. Fringe is in almost general use. The bags called ridicules are always trimmed with it. The caps appropriate to this fashionable dress are of an oblong shape, like the straw hats, ornmented with flowers, generally fancy ones. We see a few hats of pistachio green, and others sea- green. They have commonly sides; those of the present day are in imitation of a fish's shell. Most of our élégantes continue the fashion of dressing in their hair, the rest profer the peasant bonnets. The ordinary colours for ribbons are green and violet, yellow and violet, amaranthus and violet. Plain white ribbons are also very much worn; their bows are formed with very long detached points. 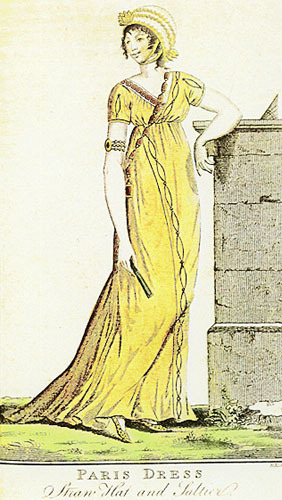 The newest fashion is a blue tunic, the bottom cut in deep points, terminated with tassels, and trimmed with yellow; the gloves reaching almost up to the shoulder, tasselled and pointed. The petticoat is trimmed with a large border of the same design as the tunic. Almost all the slippers are timmed with a narrow, coloured, silk edging, in imitation of Etruscan ornaments.